the epicyclic latitude correction factor. 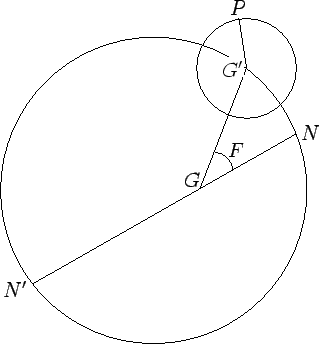 Figure 34: Orbit of a superior planet. Here, , , , , , and represent the earth, guide-point, planet, ascending node, descending node, and argument of latitude, respectively. View is from northern ecliptic pole. Here, , , , and . The constants , , , and for each of the superior planets are listed in Table 44. Finally, the functions are tabulated in Table 45. For the case of Mars, the above formulae are capable of matching NASA ephemeris data during the years 1995-2006 CE with a mean error of and a maximum error of . For the case of Jupiter, the mean error is and the maximum error . Finally, for the case of Saturn, the mean error is and the maximum error .